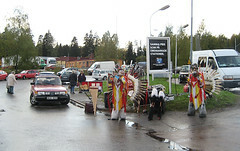 They seem so misplaced, standing by a gas station playing music, dancing and letting off smoke from a machine. But hopefully they got some of their records sold. K and I browsed the market for a couple of hours, bought six sausages, silicon baking-tins, socks, labels for stuff in the freezer and some goodies. Then we went to Irmgard’s for dinner, where Ann and Janne had turned up for a surprise visit. Nice!